Shortly after the middle of the eighteenth century a number of thinkers from the German-speaking lands began to create a paradigm drawn from their impressions of a distant historical reality, ancient Athens; added to it a new mode of thought, modern dialectics; and at times even paid homage to the ancient Greek deity Dionysos, to materialize their longing for an ideal. The influence of these forces came to permeate modern German consciousness, deifying the concept and activity of art, reviving the Platonic (and Sanskrit) vision of the cosmos as play and aesthetic creation, and projecting a way of life and labor that would honor not the commodity but the aesthetic product. 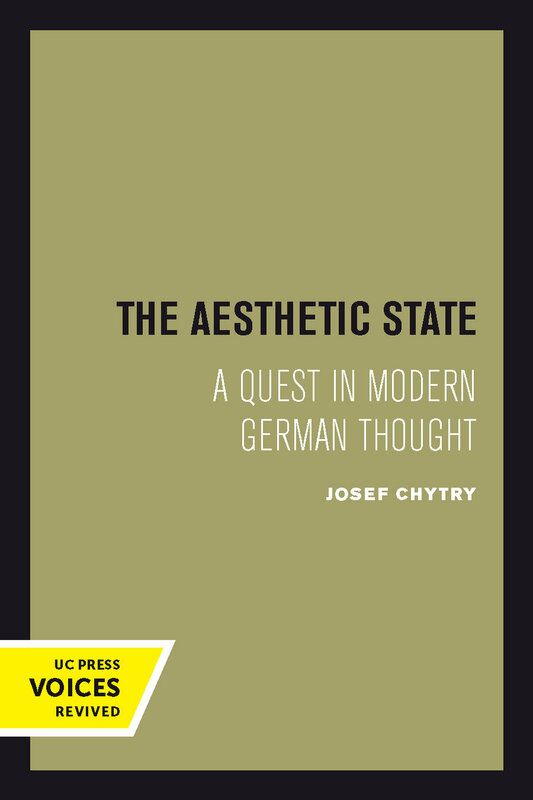 With rigorous commitment to primary sources and an unflagging critical engagement with the ideas and concrete situations they raise, Josef Chytry provides a comprehensive and extensive study of this central motif in German thought from Winckelmann to Marcuse. Chytry takes "aesthetic state" to signify the concentrated modern intellectual movement to revitalize the radical Hellenic tradition of the polis as the site of a beautiful or good life. The movement begins with the classicism of Winckelmann, Wiemar aesthetic humanism (Wieland, Herder, Goethe), and Schiller's formal theory of the aesthetic state and continues through the idealism of the Swabian dialecticians Holderlin, Hegel, and Schelling and the realism of Marx, Wagner, and Nietzsche. It culminates in the postrealism of Heiddegger, Marcuse, and the aesthetic modernist artist Walter Spies, who initiated a dialogue with the non-Western "theatre state" of the isle of Bali. Josef Chytry concludes that the future speculation on the ideal of an aesthetic state must come to terms with the postrealist themes of ontological anarchy, aesthetic ethos, and theatre state. In a bold effort to stimulate such speculation, Chytry indicates how proponents of the aesthetic state might join forces with Rawlsian political theory to promote further the organon of persuasion that, in his view, serves as the common fount for the ancient, dialectical, and contractarian quests for the polis. This title is part of UC Press's Voices Revived program, which commemorates University of California Press’s mission to seek out and cultivate the brightest minds and give them voice, reach, and impact. Drawing on a backlist dating to 1893, Voices Revived makes high-quality, peer-reviewed scholarship accessible once again using print-on-demand technology. This title was originally published in 1989. Josef Chytry is a senior adjunct professor in CCA's undergraduate Critical Studies Program and Graduate Program in Visual and Critical Studies. He is managing editor of the journal Industrial and Corporate Change at the Institute for Business Innovation, Haas School of Business, University of California, Berkeley.